When two babies are on the way, many moms have much on their minds  decorating the nursery, arranging finances, whether to stay at home or go back to work, not to mention the many changes in their bodies from twin pregnancy. However, one of the most important aspects of being a parent is creating a safe twin nursery or nurseries for your new babies. 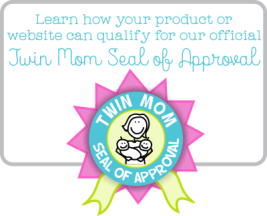 Ensure the crib is in good shape, and is fairly new (to avoid potential for lead paint). Antique cribs should be avoided. Measure the space between the slats. The gap should be no more than 2-3/8 inches. Also, make sure there are no slats missing. Also, check the rail height. To do this, lower the mattress to its lowest position and raise the sides of the crib. Then, measure from the top of the side rails down to the mattress support, to ensure there is at least 26 inches between the two. Although cut-outs in the head or foot of the crib are decorative and very beautiful, avoid cribs that have them. A baby's head can get trapped in the open spaces. Check the four corner posts to make sure they are even with the end panels. They can be as much as 1/16th of an inch above the end panels, but no more. This lessens the risk of baby's clothing catching which could be a strangulation hazard. Is all the hardware included? If there is any hardware missing, pass on this crib and move on to the next. With more specially made twin cribs available today, be sure you double check the safety standards when buying used or taking on an hand-me-down, as these cribs may have very different configurations and safety issues compared with a single crib. Once you choose a crib or cribs, make sure you check this safety list so your twins can sleep safely. Place the crib in the room away from all windows. Window blinds and curtain cords can get tangled around the neck of your babies. Check the mattress itself. It should fit snugly into the crib. If there is a gap between the crib and the mattress large enough for you to fit two fingers, it is not safe. Do not stuff the gap with a blanket. You need a new crib or mattress. 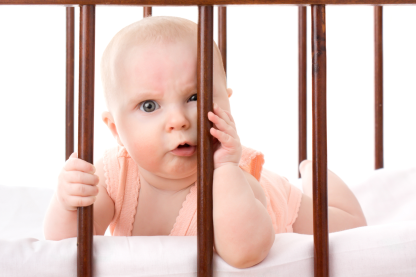 When deciding how to place two cribs in one room, don't put them directly together or too close together. This may create small areas between the slats on each crib where little hands can get stuck and/or pinched. Avoid using quilts, blankets or pillows your twins' crib/cribs until you get the okay from the pediatrician. Do not create your own waterproofing by using garbage bags or dry-cleaning bags. They can stick to your baby's face, possibly cutting off breathing. Install a smoke detector in your twins' nursery or in the hallway outside the room. Don't forget to replace the batteries every 6 months. Of course, always put your babies to sleep on their backs to reduce the risk of SIDS. If you find yourself in doubt, visit the US Consumer Product Safety Commission and read more about crib safety and SIDS reduction.